Petstages Tower Tracks Cat Toy is a winner and gets our April Best Cat Toys of the Month. First of all; this unit is very sturdy and will stand up to lots of play (even with big kitties). They really cannot destroy this toy. The big cats might move it around on hard surfaces but the new anti-skid bottom will help it stand its ground. It has three levels to entertain one or multiple cats and the balls are secured well so you are not going to be chasing balls. Cat's need toys that will stimulate both their mental and physical senses. 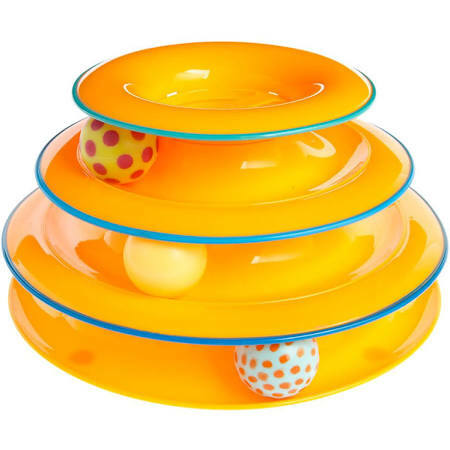 The Petstages Tower Tracks Cat Toy does just that; it creates mental stimulation with the nature of balls that spin on the track with different colors and traveling speeds and it gives them an opportunity to swat and pounce tapping into their physical needs. This cat toy has been reviewed more than 2500 times with 4.5 out of 5 stars. The videos will display both kittens and mature cats playing with the Tower Tracks toy.